The selloff in government bonds that has pushed yields higher in many parts of the world over the past two years may not be quite over yet, but the cycle is maturing and a prolonged secular bear market that puts an end to the current low rate environment remains years off. While central bankers are committed to normalizing monetary policy after a lengthy period of near zero interest rates, record high debt levels should prohibit yields from rising much higher and could be the catalyst that sends them back down again if the burden of greater borrowing costs becomes too much of a drain on the global economy. At last count, the 10-year U.S. treasury yield has more than doubled and trades near 3% from a low of 1.32% in the summer of 2016 after temporarily climbing higher earlier this spring. Meanwhile, government bond yields in many other countries have also risen over this time period, including Canada where the equivalent 10-year maturity now sits close to 2.29%. The increase in yields since 2016 has been fuelled by an improving economic backdrop and signs of inflation that have given the U.S. Federal Reserve and other central banks the confidence to gradually raise interest rates, or, in the case of the European Central Bank, communicate to markets its plans to begin unwinding their unconventional monetary policy stimulus. Where to next for 10-year U.S. treasury yields? Given these expectations for more tightening in the months ahead, there’s reason to believe that short-term government yields may have another leg up, but for longer-term maturities that will depend just as much on the strength of the global economy and inflationary pressures going forward. For most of this year, growth rates have remained relatively healthy, led by the U.S. expansion that could benefit further from U.S. President Trump’s recent tax reform and increased capital expenditures. But some economies in other parts of the world have begun to wane in recent months, including Europe and various emerging markets hit hard by local challenges along with headwinds such as the strengthening U.S. dollar. Meanwhile, trade relations between the U.S. and many of its key trading partners remain tense and could hinder future growth expectations – especially in the event of a full blown trade war erupting – while also stoking inflationary pressures. Consumer prices are already poised to pick up at least through the remainder of the year as oil prices continue to strengthen and wage hikes finally take hold in the U.S., where labour markets are growing increasingly tight, and there are now more job openings than people actively seeking work at the moment. Beyond 2018, however, oil prices would need to rise substantially again next year just to maintain current inflation rates. Anything less would end up being disinflationary and help restrain the Fed from getting more aggressive with future rate hikes than already planned. This same year-over-year dynamic is also true of other consumer expenditures on the rise, including household shelter items such as rent that are likely to abate as interest expenses continue to climb. The impact of Trump’s tax cuts and government spending on areas such as infrastructure should also diminish next year and is likely to have a lesser impact on the overall economy than would similarly-sized spending originating from the private sector. This being the backdrop, it’s difficult to imagine the kind of accelerated economic growth and steady pace of inflation that is needed to sustain an uninterrupted rise in bond yields. A more likely scenario is an uneven path from here with short term rates continuing to climb more than longer-term rates, leading to an even flatter yield curve over time. And much like in the past, that could eventually result in the Fed tightening too much causing a slowdown in the economy, if not an outright recession. If and when this outcome is reached remains uncertain, of course, but past cyclical bear markets in 10-yr U.S. treasuries have, on average, lasted 23 months and run their course after a rise in yields of just over 2.75%. In low-yield environments, such as those of the 1950’s - 1960’s and 2000’s - 2010’s, the duration and magnitude (in basis points) of cyclical rising yield episodes has been even smaller. This would suggest the current sell off is nearing an end and could give way to a period of falling yields that would lift government bond prices. 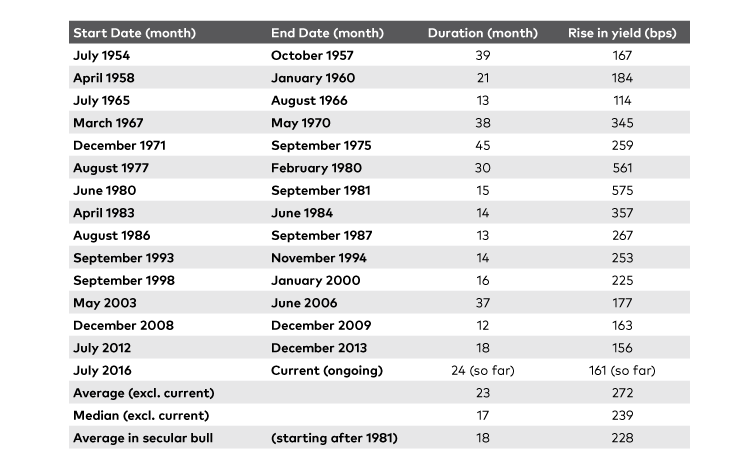 For current bear market, if May ends up being peak, the selloff would amount to 175 basis points within 22 months. This type of cyclical ebb and flow in yields isn’t unusual in the context of longer-term secular trends in bond prices. Since 1981, for instance, the yield on the 10-year U.S. treasury has fallen from 15.84%, but the decline has been interrupted on several occasions, including an 18-month stretch between July 2012 and December 2013 that saw yields increase 163 basis points before falling again. Similarly, secular bear markets in bonds have exhibited jerky trajectories of their own. Yields in the 1940s began to climb from just below 2%, for example, but took almost 20 years to hit 4.7% from the various rallies and pullbacks in bond prices that occurred along the way. Of these two scenarios, it’s hard to imagine that the secular bull market of the past 30 plus years has many legs left given the low (and negative in some jurisdictions) yields of recent years. At the same time, it’s difficult to postulate that a secular bear has begun in its place. The 10-year treasury yield would probably need to sustainably break out above its long term declining trend before giving more serious thought to a protracted rise, but even then several barriers still stand in the way of markedly higher yields than today. Demographics, for one, should keep a partial lid on them. As populations get older in most parts of the developed world, the need for fixed income will only increase and provide steady demand for government bonds. Economic growth rates are also dampened by slow population growth rates. But the biggest obstacle is record high debt loads. Previous secular bear markets happened in eras when individual, corporate and government balance sheets were in much better shape than today. Moreover, the gradual rise in yields following World War II was aided by a generation accustomed to depression-era austerity and wartime rationing that kept inflation at bay and consumer spending in check, while real growth in the economy was being bolstered by huge productivity gains and a baby boom that pushed the population growth rate substantially higher. This time around, we are at the opposite end of the spectrum and without a major reckoning, whereby much of the outstanding debt is eliminated, there probably isn’t the wherewithal to fuel the type of credit expansion that would lead to higher economic growth and yields on a sustained basis. In other words, government bond yields should remain low for longer in an environment marked by shorter-term cyclical trends. For active investors, that’s fertile ground to seek return opportunities over the next few years, but it also comes with the challenge of mitigating potential risks as they unfold. David Stonehouse is a senior vice president and portfolio manager at AGF Investments Inc. He is a member of the AGF fixed income team. Commentaries contained herein are provided as a general source of information based on information available as of July 27, 2018 and should not be considered as personal investment advice or an offer or solicitation to buy and/or sell securities. Every effort has been made to ensure accuracy in these commentaries at the time of publication; however, accuracy cannot be guaranteed. Market conditions may change and the manager accepts no responsibility for individual investment decisions arising from the use of or reliance on the information contained herein. Investors are expected to obtain professional investment advice.